This ancient enigma keeps everyone inquiring what truth lies in those huge stones and luckily you have come upon a site that will help you realize everything about Stonehenge. You have wound upon an educational articles not as old as Stonehenge, but sure one of the oldest and very likely the first covering all faces of this mystical monolithic construction. There was an outer circle of about thirty worked upright stones of square section (picture 2). On each pair of these rested a horizontal block, but only five now remain in position. These ‘lintels’ probably formed a continuous architrave (Pl. I). The diameter of this outer circle is about 97½ feet, inner measurement. The stones used are sarsens or blocks of sandstone, such as are to be found lying about in many parts of the district round Stonehenge. Picture 2. 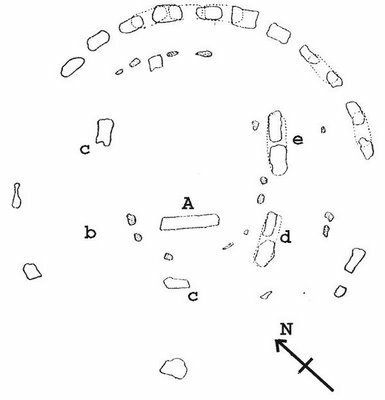 Plan of Stonehenge in 1901. (After Archæologia.) The dotted stones are of porphyritic diabase. Well within this circle stood the five huge trilithons (a-e), arranged in the form of a horseshoe with its open side to the north-east. Each trilithon, as the name implies, consists of three stones, two of which are uprights, the third being laid horizontally across the top. The height of the trilithons varies from 16 to 21½ feet, the lowest being the two that stand at the open end of the horseshoe, and the highest that which is at the apex. Here again all the stones are sarsens and all are carefully worked. On the top end of each upright of the trilithons is an accurately cut tenon which dovetails into two mortices cut one at each end of the lower surface of the horizontal block. Each upright of the outer circle had a double tenon, and the lintels, besides being morticed to take these tenons, were also dovetailed each into its two neighbours. Within the horseshoe and close up to it stand the famous blue-stones, now twelve in number, but originally perhaps more. These stones are not so high as the trilithons, the tallest reaching only 7½ feet. They are nearly all of porphyritic diabase. It has often been asserted that these blue-stones must have been brought to Stonehenge from a distance, as they do not occur anywhere in the district. Some have suggested that they came from Wales or Cornwall, or even by sea from Ireland. Now, the recent excavations have shown that the blue-stones were brought to Stonehenge in a rough state, and that all the trimming was done on the spot where they were erected. It seems unlikely that if they had been brought from a distance the rough trimming should not have been done on the spot where they were found, in order to decrease their weight for transport. 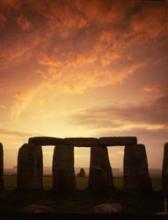 It is therefore possible that the stones were erratic blocks found near Stonehenge. Within the horseshoe, and near its apex, lies the famous “Altar Stone” (A), a block measuring about 16 feet by 4. Between the horseshoe and the outer circle another circle of diabase stones is sometimes said to have existed, but very little of it now remains. The whole building is surrounded by a rampart of earth several feet high, forming a circle about 300 feet in diameter. An avenue still 1200 feet in length, bordered by two walls of earth, leads up to the rampart from the north-east. On the axis of this avenue and nearly at its extremity stands the upright stone known as the Friar’s Heel. 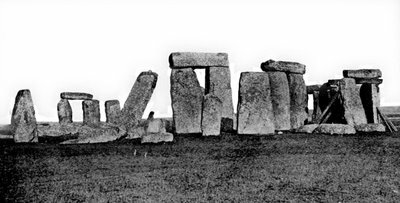 In 1901, in the course of repairing the central trilithon, careful excavations were carried out over a small area at Stonehenge. More than a hundred stone implements were found, of which the majority were flint axes, probably used for dressing the softer of the sandstone blocks, and also for excavating the chalk into which the uprights were set. About thirty hammer-stones suitable for holding in the hand were found. These were doubtless used for dressing the surface of the blocks. Most remarkable of all were the ‘mauls,’ large boulders weighing from 36 to 64 pounds, used for smashing blocks and also for removing large chips from the surfaces. Several antlers of deer were found, one of which had been worn down by use as a pickaxe. More Overmuch nine hundred stone rings subsist in the British Isles. Of these, Stonehenge is the most best known. The megalithic monuments of Britain and Europe pre-history those of the oriental Mediterranean, Egyptian, Mycenaean and Greek civilization. The Druids had nothing to do with the building of the stone rings. Druids are known to have taken their ritual activities generally in sacred forest woodlet.